This week's guest editor is Chad Robertson, the man behind San Francisco's über-popular Tartine Bakery. He'll be walking us through how to make one of the Porridge Breads from his latest book, Tartine 3, and sharing bits of baking knowledge along the way. Today: All week, Chad has been walking us through the recipe for his Oat Porridge Bread. Today, he's sharing a few more tips. Read them, learn them, love them, then go start your starter. Temperature of the environment: This dictates what yeast and bacteria will come into play, and what processes will take place. Naturally leavened, long-fermented bread is a microcosm and ambient temperature is critical in dictating the next steps of fermentation. Specific stages of smell and aroma: Dough undergoes a series of states during the fermentation process where different yeasts and bacteria inhabit it. Becoming intimately connected with the processes and well versed in the specific stages of smell and aroma are central to becoming an intuitive baker. Patience: Bread baking is not an immediate process. There are many steps involved and many nuances at play. As the baker, you are constantly adjusting in response to these variables based on your knowledge of the medium -- and your patience. More: For those of you with a little less patience, Chad has a speedier recipe: Apple Walnut Tea Cake. Working with the nature of the dough: Like I started to mention above, dough is continually shaped by its environment -- a range of uncharted variables. Since there are so many ways little conditions can affect the final loaf, you’re constantly making slight adjustments. Baking bread is not about controlling the process; it’s about guiding the fermentation. You are there to act as a catalyst for what the dough naturally wants to do. Depth of flavor and texture: My bread has a deep, crackly crust and a soft, moist crumb. For me, it’s a balance between these textures. 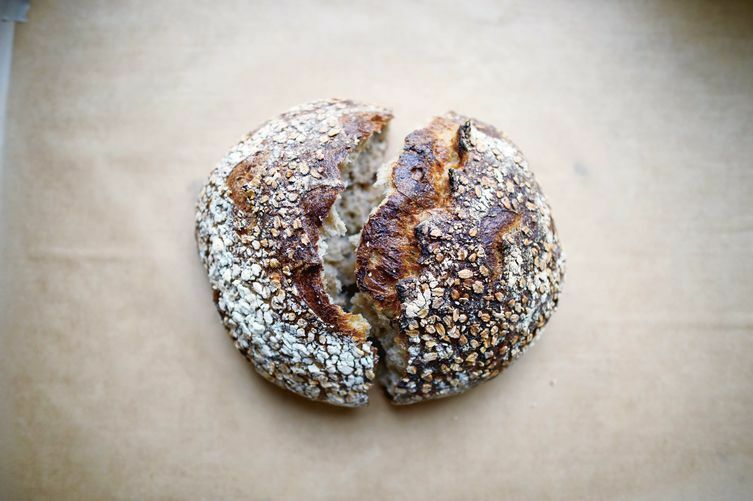 Using high hydration, naturally leavened dough and initially baking at a high heat then lowering the temperature imbues each boule with sufficient oven spring and layers of caramelization. More: Are you ready? Here's Chad's recipe for Oat Porridge Bread. A Texas native, Chad Robertson always knew he wanted to devote himself to a profession that involved the craftsmanship of his hands. Robertson enrolled at the Culinary Institute of America (CIA) in Hyde Park, New York but quickly became entranced by the art of bread baking. Robertson's first apprenticeship was at Berkshire Mountain Bakery under the guidance of Richard Bourdon. There, Robertson worked 12 hour shifts where he would pull 3,000 loaves a day. From there, he - and wife, Elisabeth Prueitt - journeyed to France and the French Alps to continue learning the intricacies of working with wood fired ovens and naturally leavened, long fermented breads. Upon their return, they became involved with Dave Miller in Chico, CA where they continued to hone their skills and understanding, this time with a larger focus on whole grains. Soon after, Robertson and Prueitt moved to Pt. Reyes, CA where they built a modest bakeshop called Bay Village Bakery. It was here that Robertson baked for 18 hours straight with the intent to perfect his technique by focusing on "three ingredients and a world of possibility." After five years in the country, the hum of city life beckoned. In 2002, the couple opened Tartine Bakery, which almost instantaneously became a San Francisco institution. In 2005, the couple opened Bar Tartine, a restaurant that continuously redefines itself and draws inspiration from all corners of the globe. In 2006, Robertson and Prueitt published the Tartine Cookbook (Chronicle Books), in 2010 Robertson published Tartine Bread (Chronicle Books), and in fall of 2013 Robertson published his third book, Tartine Book No. 3 (Chronicle Books). He is the recipient, with his wife, of the 2008 James Beard Foundation Award for Outstanding Pastry Chef and has been featured in a variety of premier media outlets, including Bon Appetit, Elle, Vogue, Food Arts, Food & Wine, Saveur, and The New York Times. Chad Robertson is considered one of the leaders in naturally leavened bread baking. As a longtime home baker, I find Robertson's recipes unnecessarily complicated especially with temperatures and mixing by hand. Julia Child's croissant recipe, for example, is simpler and straightforward and produces better results than Robertson's. I also doubt that his bakery, obviously a smash success in SF, mixes and kneads breads by hand as he wants us to do. I am curious how any small artisan bakery (that isn't a factory) can produce 3000 loaves a day? I have 50 square feet of wood fired oven space that does 70-75 loaves at a time. I can get three bakes done an evening. A fourth bake would be potentially doable. It takes all day (from 6 in the morning until sometimes midnight when we pull the last loaf) to make up starters & dough, proof, bench rest, shape and proof again. Then it takes time to load and unload the oven. Then it takes 20-30 minutes a bake depending on oven temp and variety. This is all I can manage with just myself and my partner. 3000 loaves a day blows my mind. I hope he had lots of staff! Chad Robertson is an inspiration to be sure.